Italy edged the UK team to winning the 2011 PokerStars World Cup of Poker at 1am on the 15th January 2011. The Italian team of Davide Scafati, Litterio Pirrotta, Marco Mancini and Ravel Furfaro and PokerStars Pro Luca Pagano edged the UK team to win their first ever WCP which includes a $100,000 cash prize ($25,000 for each team member). 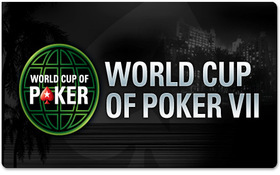 The World Cup of Poker started in 2004 and is an annual poker tournament sponsored by PokerStars. The WCP includes a total cash prizepool of $290,000 and begins with 46 different teams playing against each other in round robin tournament structure. The WCP comprises of a series of formats including heads up, one-on-one of NL tournaments, and players can qualify for the land-based tournament through a series of online qualifiers at PokerStars. Some have even suggested that the World Cup of Poker is the best poker tournament in the world – or that it is just like the FIFA World Cup but with 700 million less spectators and that the UK has a chance to reach the semi-finals! Played over in the Bahamas at the PCA, it was a bittersweet result for the UK team which came 2nd for a $70,000 cash prize. The UK team was led by none other than the new PokerStars Pro Team Member Liv Boeree. The winning hand came from the Italians at 12:57am when Liv Boeree shoved with A3 off suit only for the Italians to call with AQs. The board ran 4-Q-K-8-3 giving the Italians their first ever WCP victory. Previous WCP Champions have included: Costa Rica (2004 and 2005), Poland (2006), USA (2007), Germany (2008) and Chinese Tapei (2009). This poker news post was sponsored by Instant Win Games. This entry was posted on Monday, January 17th, 2011 at 10:46 am and is filed under Poker News. You can follow any responses to this entry through the RSS 2.0 feed. You can leave a response, or trackback from your own site.